Chocolate pudding cakes are the quick-fix way to make a molten chocolate cake. They’re cakes that bake into two layers in the oven all on their own – a light cake and a rich chocolate sauce. Coffee is a great way to boost the flavor of chocolate and make it seem more intense, so it’s usually a great addition to a chocolate dessert. In the case of this cake, there is so much coffee that the whole dessert takes on a mocha flavor. 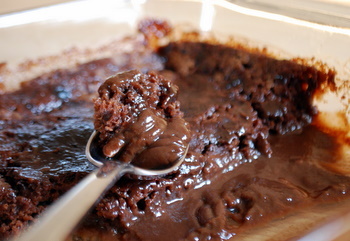 The pudding is smooth and chocolaty, with a consistency somewhere between warm pudding and chocolate sauce. It adds a lot of moisture to the chocolate cake layer, which is fairly thin, but provides the perfect amount of cake to go with the sauce. The dessert is easy to make and is a great way to use up the coffee still in the pot after you’ve already had a cup or two. If you don’t want so much mocha, you can always opt for a regular chocolate pudding cake, instead. Sprinkle brown sugar and remaining 1/4 cup cocoa powder evenly over batter. Add vanilla to the hot coffee and pour over everything. Do not mix. Place pan in oven and bake for 30-35 minutes, until surface of the cake looks dry. The pudding will be bubbling around the edges. Allow to cool for about 10 minutes before serving. Serve with ice cream or whipped cream, as desired. Leftovers, if you have them, can be stored in the fridge. Reheat before serving.